New Arriva Co., Ltd., a business owned by Mr. Thosaphol Suppametheekulwat, MUIC Class of 2002, received the Outstanding Marketing Strategy Award at the recently held SME Thailand Inno Awards 2017. Mr. Thosaphol’s company has been exporting its products to 50 countries for more than 10 years. 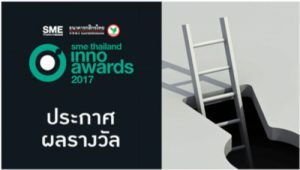 There were 287 entrepreneurs who joined the SME Thailand Inno Awards 2017 and Mr. Thosaphol’s New Arriva Co., Ltd. was one of the 11 awardees.